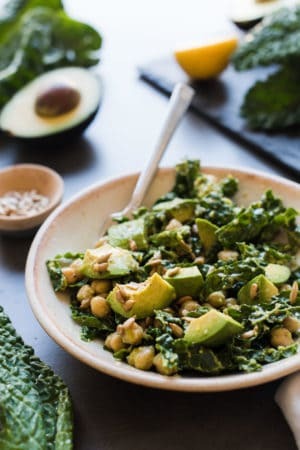 This Lemony Kale, Avocado, and Chickpea Salad from the Simply Vegetarian Cookbook by Susan Pridmore is simple, wholesome, and easy to customize for all the eaters in your family. 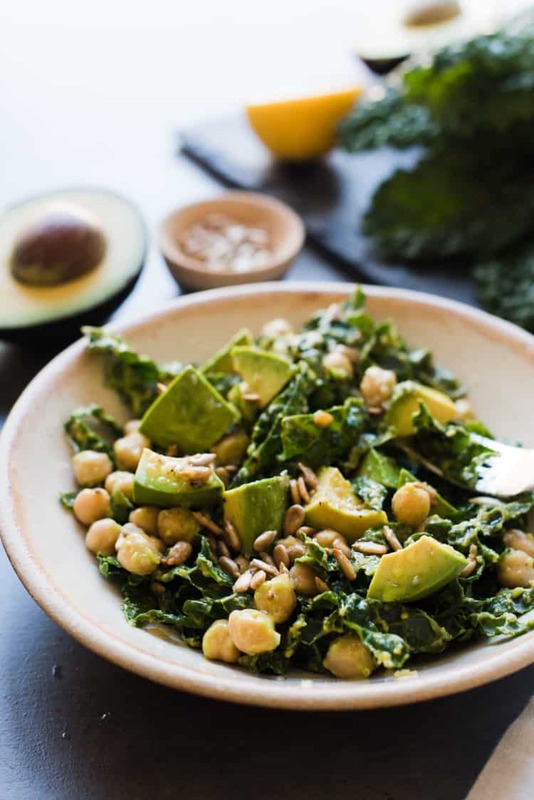 This Lemony, Kale, Avocado, and Chickpea Salad massages a raw kale salad with avocado mash and a lemony dressing. Plus, it’s simple and easy to customize for all eaters! This is the first line of the introduction in my friend Susan Pridmore’s new cookbook, Simply Vegetarian Cookbook: Fuss-Free Recipes Everyone Will Love, and I could have written the entire section myself. I almost felt as though she had taken a telescope and looked into and written about my life — when cooking used to be as simple as firing up the grill, passing some beautifully marinated meat to my husband to fire, while I focused on some simple salads and side dishes. But like Susan, there have been changes with the eaters in my family. My daughter has returned to her pescatarian ways, and my husband has kind of followed suit…he now eats mainly fish, but also is pursuing a less cholesterol-laden diet, which has changed the way I approach desserts. My son is still happily omnivorous. As for me, well, if you remember, I’m kind of like a part-time vegetarian — plant based by day, omnivorous by night. With so many kinds of eaters in the family now, well, cooking dinner has become more challenging. I wonder if it’s the same in your house? I first met Susan last year at an intimate cooking class up in Sonoma, and how serendipitous, because her book came at the perfect time as my mindset has had to shift when it comes to cooking. I’ve always said I would never be a short order cook, and her new cookbook shows me that I don’t have to be. While she is a vegetarian (her blog is aptly called The Wimpy Vegetarian, you should check it out and find out why), her husband most certainly is not, and each of her recipes offers flexitarian tips to please all the eaters in your family. Flexitarian is such a good word, by the way. I’m really feeling like one these days. 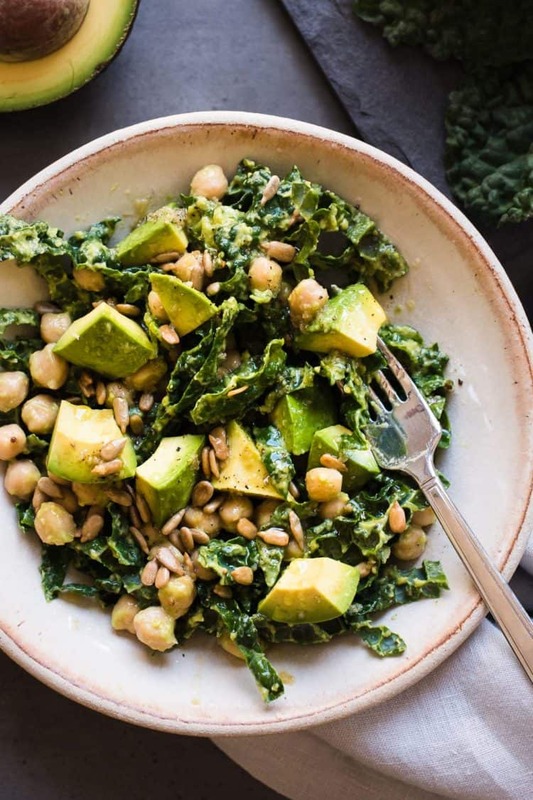 This Lemony Kale, Avocado, and Chickpea Salad is the kind of kale salad with avocado my family already enjoys and a great base on which to build on. It’s in her Five Ingredients chapter, proof that delicious food doesn’t have to be complicated, but if you’re like me, and can’t resist complicating things, then feel free to riff on it! I added a little bit of roasted garlic to mine, for example, and swapped out curly kale for lacinato, and sunflower seeds for pumpkin. And for the flexitarians (like my son! ), her recommendation of adding roast chicken to the salad is spot on. Life used to be easy, but it turns out, it still can be. 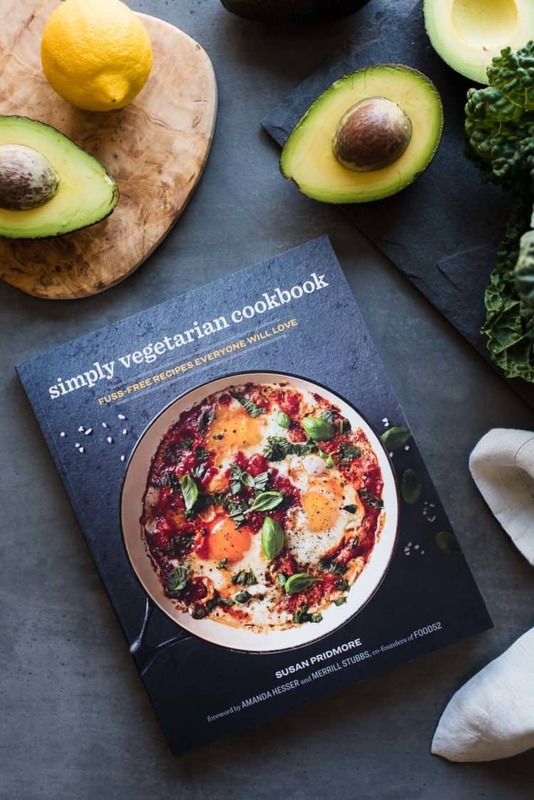 Check out the Simply Vegetarian Cookbook: Fuss-Free Recipes Everyone Will Love on Amazon! Disclosure: I was sent a copy of Simply Vegetarian Cookbook for review. All opinions, are of course, my own. There may be affiliate links in the post, see my Disclosure page to learn more. This kale salad from Simply Vegetarian Cookbook by Susan Pridmore is one of the recipes in the Five Ingredients chapter -- it's simple, wholesome, and easy to make for all the eaters in your family. Her flexitarian tip is to add roasted chicken to the salad. Scoop the flesh from one of the avocado halves out of its skin and put in in a large bowl. Add 1 tablespoon of lemon juice an 1/4 teaspoon of salt, and mash everything together. Add the coarsely chopped kale leaves and massage them by hand with the avocado mash until the kale becomes tender. Place the kale-avocado mash on a serving plate. 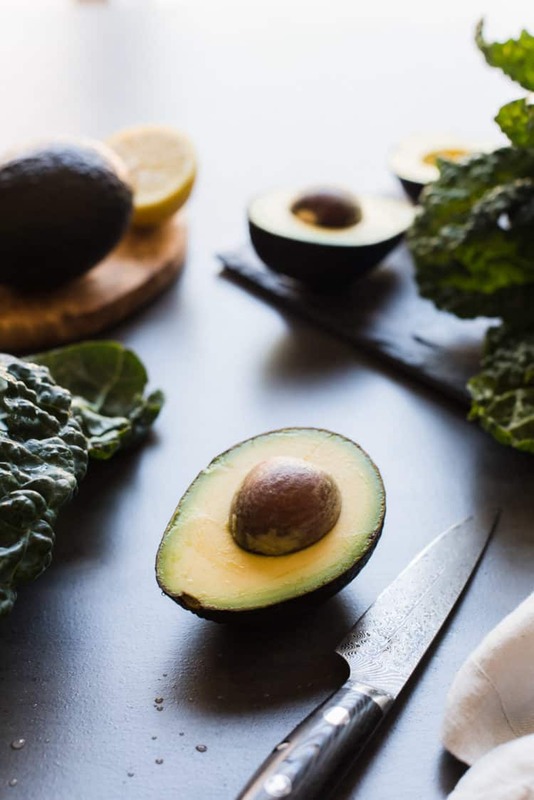 Remove the flesh of the remaining avocado half from its skin and chop into bite-size chunks. Please in the bowl that contained the kale, and add the chickpeas. In a small bowl, whisk together the olive oil, remaining 1 tablespoon of lemon juice, remaining 1/4 teaspoon of salt, and the pepper. Drizzle over the chickpeas and avocado and toss to combine. Pile on top of the kale-avocado mash, and top with the roasted pumpkin seeds. In making this recipe, I've made a few substitutions based on taste and availability. Lacinato kale works in place of curly kale, and in general is a more tender option. Sunflower seeds are just as delicious in place of roasted pumpkin seeds. Recipe reprinted with permission from Simply Vegetarian Cookbook: Fuss Free Recipes Everyone Will Love (Rockridge Press, 2018) by Susan Pridmore. What a beautiful post, Liren! From your deliciously gorgeous photos to your kind words about my cookbook. From the bottom of my heart, I thank you! This is so my kind of salad and one that would make my family of two very happy. Love the word flexitarian, too–we’re mostly pescatarian also (and sometimes chicken)…until the occasional Filipino food craving hits–then I eat pork for a week because I know only to prepare it in family-size portions. Will have to make this salad, yum! This is fantastically done. I love it and I probably can consider getting this Simply Vegetarian Cookbook. I love Susan, her new book, and this kale salad. Sounds very refreshing, perfect for summer, and a flexitarian like me! I am all about simple multi texture salad, a little crunch and little bite. this sounds perfect and that book sounds fantastic. Must get a copy! Your words are always so beautiful Liren. I hear this a lot, Liren. Different diets under the same roof. What’s a home chef to do? This presents all kinds of challenges indeed. I’ll need to pick up Susan’s book – I’m in love with her simple, texture rich salad and you’ve captured it so beautifully! Thank you for this delicious recipe. I love kale and love exploring with it. This was a perfect salad for our dinner with friends tonight. Everyone enjoyed it so much.